Under hanging straps are awesome and while there are plenty of high quality options out there (Cloop and carry speed are two of them), there is also plenty of room for DIYing one of those. “I took a trip to the hardware store and voila! problem solved. All you need is about five bucks worth of stuff: metal and rubber washers, a 1/4” eye bolt and some kind of locking or spring loaded chain link or carabiner. 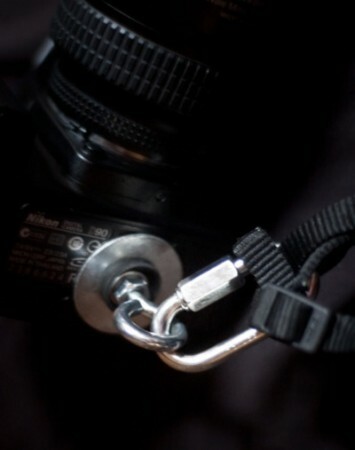 Throw it all in the bottom of your camera and attach your favorite strap and that’s it. One of my cameras has the original Nikon strap attached to the link and the other has an old guitar strap.